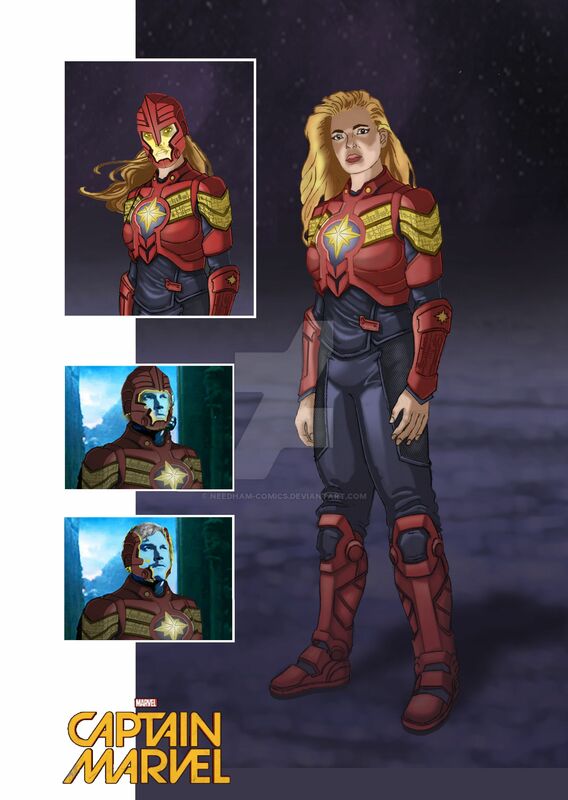 This is my concept art for Carol Danvers/Captain Marvel movie. Since there has been very little of the Kree actually shown I had to look at other sources. I used Ronan the Accuser from the Guardians of the Galaxy movie, the Kree Ambassador, the other designs from the Guardians like the Novas and Thor for Carol's designs. If you look at the Marvel movie universe the characters that are human based like Captain America, Fury, Hill, Hawkeye, and Black Widow, their costumes are made of fabrics, straps, buckles, and zippers. Aliens like Thor and Ronan, for example, wear armor with intricate designs. Her costume is Kree armor. Metallic like Iron Man's, colored red, over dark Fabrics like Thor's (not leather). Her Yellow Captains Bars styled stripes leading to her star logo have (what I hope) is Kree writing that we are seeing on Agents of SHIELD and on Ronan's ship. And if you look at the Guardians clothing things are sort of off center and at odd angles. But they also seem to be trying to make sure the alien worlds are believable too, or maybe its that they aren't too powerful. The Novas weren't shown to have powers and wear tech armor. So I was unsure if the Kree soldiers like Mar-Vell would have powers. Or perhaps he would have powers because the Asguardians are super strong and what not. Plus I needed a reason why Carol would wear a costume in the first place. Why not just a SHIELD jump suit? So I came up with a concept that might cover all bases. In the film Carol teams up with Mar-Vell to stop Yon-Rogg and his troops. During the film near the end (like where Thor gets his powers back or where Reece dies in Terminator 1) Mar-Vell is dying. He splices his DNA onto Carol's so she can wear his armor and save the city and defeat Rogg and the Sentry. That way she gets the costume. The armor maybe is what has the powers. Like a much more advanced Iron Man suit, since it is Kree and the Kree are the most advanced aliens. It could even be reasoned that Carol's DNA is altered to have the powers by the end of the film with advanced Kree Nano-tech. Anyway like in the comics and like Star Lord's helmet in Guardians her herlmet forms and evaporates around her head instead of being a helmet she must put on and take off. Whe she is in space or flying at top speeds her helmet shields her with an energy field. Likewise, also like the comic, her costume can form around her or evaporate in a blaze of light when she is putting it on or taking it off. 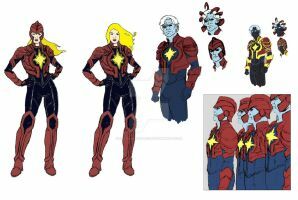 I used her current costume as the main reference but also added in the Ultimate Mar-Vell design since that is what they used in the popular Avengers cartoon. 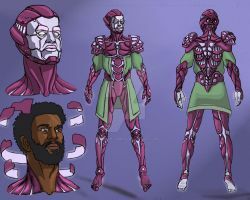 I also tried using Mar-Vell's original Trojan Soldier design as well as her other designs. I want Carol to be a character as powerful as Thor and as popular to be considered one of Marvel's top characters up there with Stark, Cap, and Thor. And if you want feel free to cosplay this costume if anyone feels like it. Its $25 for a head sketch to the shoulders in pencil on 11x17 paper. $50 for a full figure in pencil on 11x17 paper. $75 for a full colored/cleaned up figure drawn on 11x17. And add an extra full body colored figure, + $50 per extra figure. I can also draw your own personal characters! Nice work. I really have a feeling she will run into the Guardians of the Galaxy in her up coming movie. 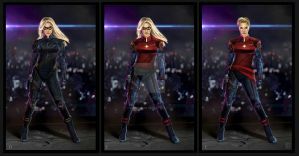 let's see ronda rousey wear that and see if she can truly be carol danvers. Cool! I can totally see Captain Marvel as a way to bridge the gap between the Avengers and Guardians of the Galaxy (the characters, not the movies). Awesome Carol as Miss Marvel you draw, I think I like it. You've done it again. I think it maybe too armored. But looks great anyways. Keep at it, you're doing a fantastic job. Excellent design as always Needham! I was having a difficult time figuring out how I wanted to do Carol, but you designed a perfectly good version of her keeping the MCU in mind. I'm moving on to tackle the "Inhumans". Looking forward to seeing more! I look forward to seeing your Inhumans. and thank you. Hmm, combining her current comics costume with the Ultimate Kree tech armor and the ornamentation and texture of the MCU. I like it! Neat design. I wouldn't bother with the helmet, as long as her hair is sticking out of it anyway, it doesn't seem to have much of a function. Otherwise, awesome look. My idea with it was that the Kree wear Roman like helmets that form around their heads. When Mar-Vell gives her his armor she has it. But like Thor and like Peter Quill she either looses the helmet or doesn't use it 90% of the movie. DUDE! How are you not working for Marvel Movies! This is awesome! What's next? Thanks you for saying that. I'd love to work for them. Can you tell them that? Wish I could, we need to meet at comic con or something and find the people who work on the movies. You don't have to worry about Carol not being powerful enough. Apparently, Word of God is that Carol Danvers is one of, if not, THE most powerful character in the MCU, and with source material as rich and vibrant as her solo series, there's no doubt that Carol's gonna be a mainstream hit for years to come. Awesome job, by the way. Thanks. Glad to hear about her role in the movieverse. She is a great character and I heard one of the reasons fore her redesign and reboot was to have her be a role model for little girls. So her being on the level of Thor would be great. One thing that I hope they keep in the movie in 2018, and this is a small thing, but I hope they keep the Star Wars references and Carol's love of Star Wars intact. Me too. Because I read where woman said it helps show that women like that too. Another way to role model for young girls. Plus its a cool character thing. It's certainly possible, Disney owns both Marvel and Disney, and Guardians of the Galaxy was pretty pop culture heavy, I wouldn't put it past them to have Carol wearing a Star Wars shirt at some point. Plus, come Avengers 3, we could have Carol and Peter become Star Wars bros.
She has also done that a few times in the comics, its a character trait that helps define the character and, AND, the new Star Wars films are coming and they ma want to subliminally advertise. But its just a neat characrter defining trait to me. She grew up wanting to be a pilot, likes Star Wars, maybe joined SWARD and SHIELD, the Navy, etc. Then she meets Mar-Vell and fights aliens.